While poverty in Sri Lanka’s post war economy appears to be reducing, this does not give the whole picture, argues Anupama Ranawana, who claims that there is a wall of silence around the poverty and inequality experienced by many. To address this she writes, the government must not only consider more inclusive means of growth, but also deconstruct and decolonise neoliberal narratives of hope. The numbers for Sri Lanka’s post-war economy seem on the whole, clear. Poverty, measured monetarily, looks to be reducing. According to World Bank figures, Sri Lanka is a lower middle-income country and in 2017 its per capita income of $4,065. The post-war economic growth rate has been recorded on average at a rate of 5.8% per year, indicating what economists refer to as a “peace dividend”. Unemployment is at 4% and poverty that is documented is noted as being “extreme poverty” that is rare and concentrated to “geographical pockets.” During the period from 2009 to 2013, Sri Lanka achieved a 6.7 per cent target of annual growth, with public investment in infrastructure coming in at an average of 5.5 per cent of gross domestic product. Poverty rates fell from 22.7 per cent in 2002 to 6.7 per cent in 2012. The World Bank Systematic Country Diagnostic proclaims that Sri Lanka is a development success story, and the country seems on track for a long-term period of sustained economic growth Indeed, in a recent statement to launch several development schemes, the Finance Minister Mangala Samaraweera noted happily that the rate of inflation was down to 1.6% in April 2018, and that the country’s Primary Account was in the surplus for the first time since the 1950s. Although, as of May it was at 4%. The rate of inflation in the post-war economy has entered into a pattern of significant fluctuation. Post-war divisions: a tale of two economies? These fluctuations indicate that numbers may not always appraise us of the whole story. 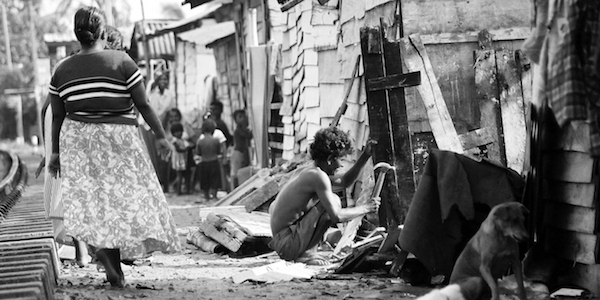 When we move beyond the numbers, and ask of post-war Sri Lanka, Homi K. Bhabha’s question of ‘what does it mean to live?’, we can see how poverty occurs through systemic silencing. Indeed, in previous writing on livelihoods in Sri Lanka, I have noted that there are two different post-war economies; one that moves forward, and one that struggles in ‘silences’. These silences are maintained and exacerbated by inequalities predicated by caste, class, religion, gender (troubled by hegemonic masculinity), geographic location and ethnicity. To expound on this further, locally based research notes that everyday silencing occurs through exclusion from political participation, limited access to economic resources and outcomes, dysfunctional social services and traditional hierarchies, and a socio-economy that is habituated to being dependent on international assistance. Households are also challenged by social difficulty, where, in a community that understands strict hierarchies, such as caste, gender based work, class, and religion, certain livelihoods are seen as demarcating a socially inferior status. An example is from the North and the East, where women who work in the tourism industry and therefore defy social controls face social stigma and ostracism. These women, therefore, have difficulty accessing secure livelihood because they are being denied entry into male spaces. Silences manifest intersectionally, in what Keeanga Yahmatta-Taylor refers to as “oppressions [that are] interlocking or occurring simultaneously, thus creating new measures of oppression and inequality.” There are high levels of debt due to micro-credit schemes (and lack of access to formal loan schemes), and strong correlations between the households’ ability to increase productivity and the failure to extend credit schemes to these households. “Widows and disabled are the people that need samurdhi (welfare). Even the family that goes abroad, if they have a widow or disabled because of the war, then they need samurdhi assistance. Those who are poor, they come to the local official with their stories of sadness. Yesterday a lady came to see me, who was war affected. Her husband has gone abroad, she has 6 children. It is hard to find food and drink and basic needs, she says. This gives me great sadness. This is the status quo, that we as government officials cannot even assist with basic needs. the highway is being built but people don’t have money for the bus. But these people are targets for microfinance companies. Microfinance companies only want to make a profit. Poor people will sign anywhere because they need money. They use the money for everyday things like tuition fees or to buy lunch. These are small amounts. The microfinance companies target female households. There are so many of these companies”. A further example comes from research on secure livelihoods conducted by the Centre for Poverty Analysis that noted how caste-based problems inhibit people’s ability to build safe and resilient livelihoods, and reinforces the status quo of systematic marginalisation and chronic poverty. In Jaffna, in the Northern Province, this is a particular concern due to caste-based discrimination in the provision of and access to services in traditionally marginalised communities. A student from an oppressed caste background can face systematic and long-term verbal and physical abuse by teachers or fellow students, causing grave harm to their wellbeing and severely impeding their ability to learn. A woman walks through a street, Gampaha, Sri Lanka. Photo credit: Iulian Circo, Flickr, CC BY-SA 2.0. Furthermore, there has been a manifestation of a ‘throwaway’ post-war culture. A centre-periphery imaginary is pervasive here, making some more disposable than others, a problem faced primarily by the country’s youth. Youth who go to schools in the centre are more flexible, linguistically diverse and more capable of transitioning to the knowledge needy job market. Youth from rural areas, however, do not receive these flexible skills. Although higher education is free, there is limited access. There remains an incongruity between educational qualifications and the job market and thus youth unemployment is a country wide issue. Indeed, the total unemployment rate for male and female youth has also shown a gradual increase since 2010. There are gender disparities, too, with more women in the classroom and more men involved in unions and youth activism. Neither do available jobs meet levels of aspiration. Have a chat with any young three-wheel driver, and most will tell you that they are a university graduate, only driving a taxi until such time as they can transition into a white collar job. This fuels a politics of resentment that leaves youth vulnerable to manipulation by extreme ideologues, such as the visually noticeable youth participation in anti-Muslim riots in March 2018. As Najab et al note, the challenge that the country faces, moving forward, is one of inclusive growth, and in tackling horizontal inequalities that are now structurally embedded. In doing so, it is crucial for academics, policymakers, businesspersons and the everyday person on the street to engage in a long-term conversation on understanding the horizontal and systemic social deformities that exist in the complex economics of modern poverty in the Global South, calling to mind Gutierrez’s argument that poverty is a kind of death. There are different types of poverty, and multiple disadvantages, and, as the Sri Lankan government moves forward to embrace economic growth, a need to ethically and epistemologically decolonise neoliberal narratives of hope.